New Thundersley Primary School - To 1950's Living Conditions. 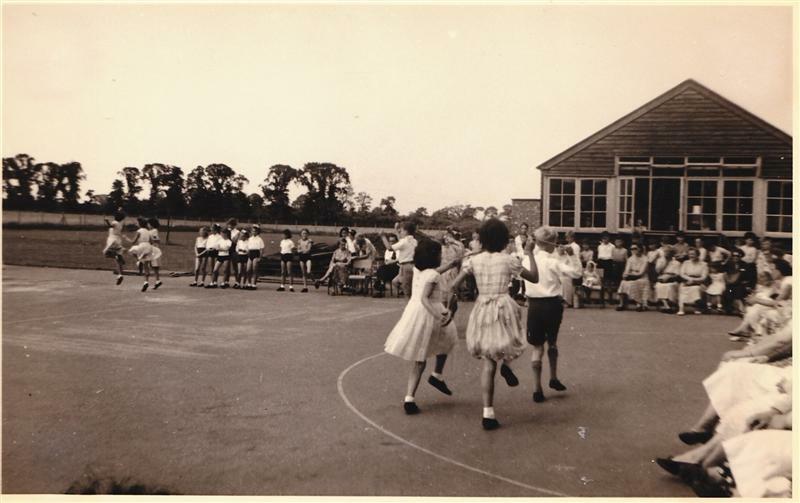 Children in the playground at New Thundersley Primary school, 1950's. This is one of the three wooden classrooms. The new swimming pool, behind the classrooms. 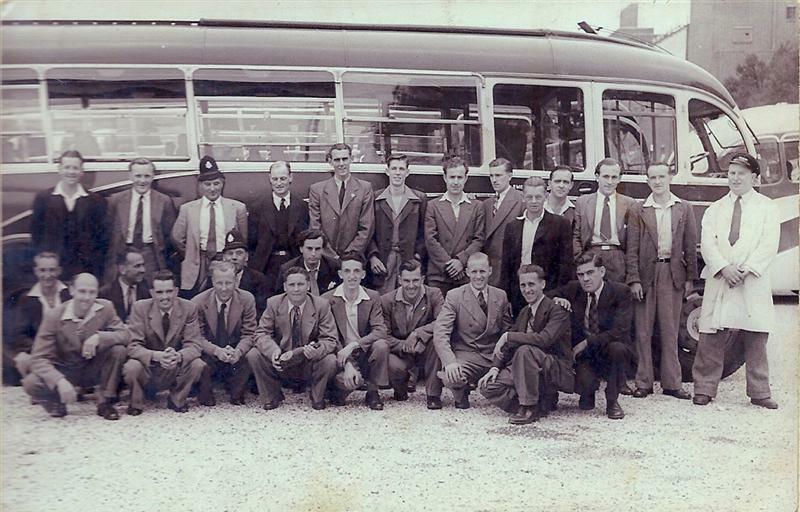 A day out for the men in Southend. Doreen was born in Benfleet, here she talks about her childhood memories and gives a real insight to what Benfleet was like. For Ernie Rogers memories of this school. Description of A13 and how it was widened taking part of the gardens. Details of the head mistress, a look was enough. Trips to Southend by coach. The men would come back from Southend with 'Kiss Me Quick' hats. Walks across the fields to school in Rushbottom Lane and the men would come back from Southend with funny hats. Living conditions in the home. It was cold with ice on the windows, description of bath time, how hot water was heated. Mum was a dress maker and description on doing the washing for a lady who was elderly. Briggs Motor Bodies used as a relief center in the Canvey Floods. Briggs Motor Bodies where Canvey Supply is now. 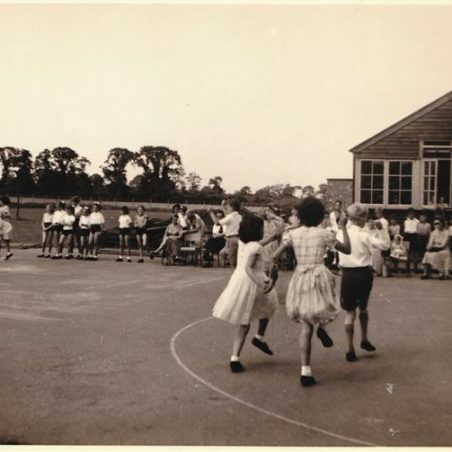 I went to Rushbottom Lane school 1954. I remember Beryl Gigins, Lesley Wright, Sharon Hinton, Neil Hambrige, there is a photo of our class in front of our nativity. Hi Doreen, I remember your name, do you remember a Mavis Turner, I was born in 1947, and started school 1952, from there went to King John. H Doreen, I am sure I was in the same class as you at ‘Shipwrights’, (King John School). I vaguely remember you falling asleep whilst sitting at the desk in front of me, in Mr Laughtons class. I hope I remember correctly? Mr Laughton, in a bad mood threw a wood and felt blackboard rubber at you and it ended up on my desk. I threw it back AT him and got sent to Mr Bailey for punishment. 1 stroke of the cane, for my actions. I never did feel it was fair, because Mr Laughton didn’t get any punishment for throwing it at you in the first place. Different world completely now eh? I lived in Seamore Avenue from 1956. My old mum still lives in the same property. I well remember the 40 acre ponds. They actually ran on the North side of Woodside Avenue. There were 3 ponds with Sticklebacks, newts. I can remember when they started filling in the ponds, all us local kids went up there to rescue the wild life. I can also remember the whole area around Rushbottom Lane, Overton, Stansfield Road & Woodside being developed. I used to help the local milkman & remember as the houses & roads were built. The old 3 wheeled milkfloat in & out of the muddy ruts. I remember my road, Seamore, being unmade just past our house & logging the numbers of the fleet of Karrimore cement lorries that brought the concrete that was laid to build the road. We used to collect all the R-Whites lemonade bottles discarded by the workmen & take them to Mr. Lees shop in Church Road to claim the threepence on each bottle. Great interview sis! Got a few little bits I remember to add too. 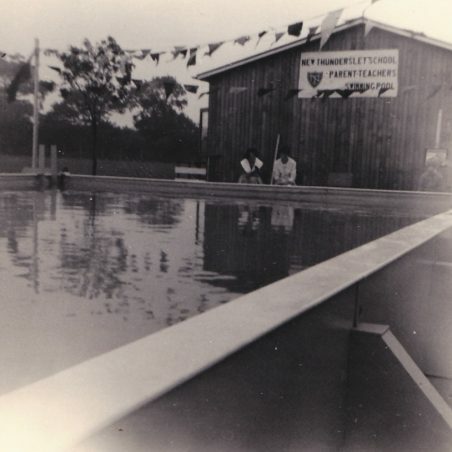 The picture of the swimming pool is of me on opening day. After paying 6d, for ever, per week, and it was all written down on a little card, I think I got to swim in it once and that was to look after the little ones and then I left for secondary school. 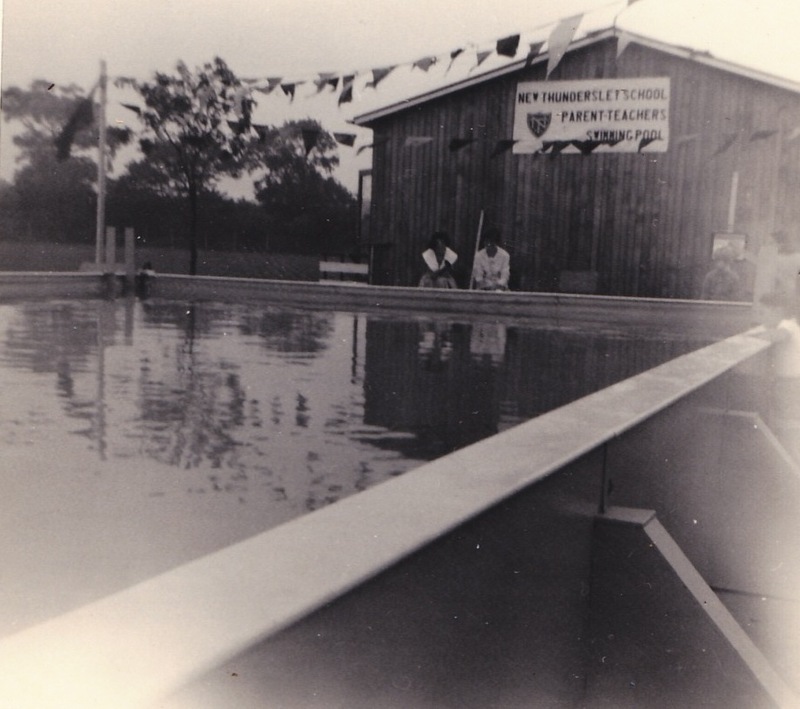 We used to go on a double decker bus to Battlesbridge swimming pool for swimming lessons. 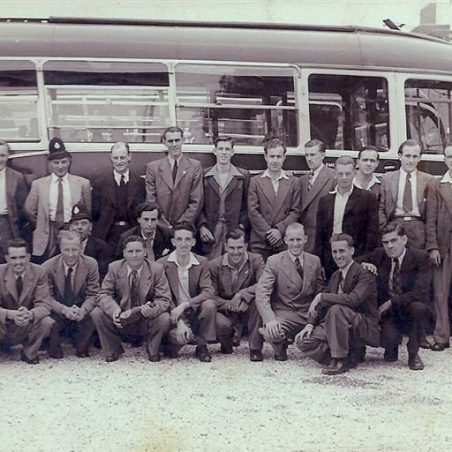 When we were crossed over the A13 for school we were crossed back again at Tarpots library by Mr Hayes because next to the library were big lorries driving out of Essex Carriers, a transport firm. Forty acres used to go from Rushbottom Lane to Manor Road where there used to be a pond where we used to catch tadpoles, there was a rope swing too. That’s now a church and grave yard at the top of the hill in Manor Road.